CAROLYN POLLACK RELIOS STERLING SILVER FLAT CABLE LINK CHAIN NECKLACE 3 FEET! Lovely sterling silver flat cable link chain necklace by Carolyn Pollack. 36" and has an "S" link closure. Gram weight is approx. 1/2" x 3/8". Trending at $97.19eBay determines this price through a machine learned model of the product's sale prices within the last 90 days. The charms are 4 styles, pointy and round clover's, and their silhouettes. A long and finely made necklace featuring 8 solid 14K yellow gold charms separated by a supple 14K yellow gold rolo/cable chain. Lois Hill Station Necklace. Shipped with USPS First Class Package. Beautiful, discontinued design. Purchased at Nordstrom. Never worn. Perfect condition. 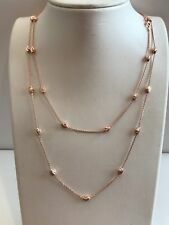 Features: Toggle ClaspLength: Over 35"
ROSE GOLD OVER 925 STERLING SILVER 36" LONG DIAMOND CUT OVAL BEADED ITALIAN MADE NECKLACE.IT CAN BE WORN AS A SINGLE OR DOUBLE AROUND THE NECK. TOTAL WEIGHT 9 GRAMS. CHAIN LENGTH 36" LONG. Genuine. 925 Sterling Silver Bead Box Chain Necklace. Sterling Silver Box Chain 36" long and 3.0 mm. Genuine Sterling Silver. 9 Sterling Silver Beads 9.8 mm. NO RESERVE. WE ASK THAT YOU DO THIS TO PREVENT ANY MISUNDERSTANDING, CONFUSION, AND INCONVENIENCE. Ending Today at 6:30PM PDT4h 56mMetal: Stainless SteelFeatures: Toggle ClaspLength: Over 35"
ANNA BECK ORIGINAL. =ANNA BECK =. THIS BEAUTIFUL ANNA BECK ORIGINAL. 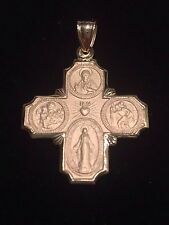 23 GRAM STERLING SILVER 925 40" NECKLACE. IS HIGHLIGHTED BY 20 LARGE AND SMALL TEXTURED ENHANCERS. 925 STERLING SILVER DESIGNER NECKLACE. This is a nice heavy ball chain necklace marked 925 and neat giraffe pendant also marked 925. Between them, they weigh 19 grams. Otherwise very good condition. Ending Friday at 12:08PM PDT3d 22hMetal: Sterling SilverStyle: PendantLength: Over 35"
Beautiful and Versatile Milor Sterling Silver Chain. This chain is 53.5" from end to end. It is 2.14mm wide and weighs 24 grams. There is a screw across the top closure that securely holds the coin in the bezel. Also, there is a soldered Sterling Silver Bail for hanging your pendant on up to a 6mm Chain. FOR THOSE BEZELS, SEE OUR COIN BEZELS CATEGORY. ITALIAN MADE 925 STERLING SILVER DIAMOND CUT BEADED NECKLACE. NECKLACE LENGTH 36". Ending Apr 28 at 7:00PM PDT6d 5hMetal: Stainless SteelFeatures: Toggle ClaspLength: Over 35"
Extra long sparkly sequin chain necklace. Metal: sterling silver Hallmark: 925 Iator Italy Size: 100" length, 2.4mm width Weight: 14.3 grams Clasp: lobster claw . DAVID YURMAN Sterling Silver Quatrefoil Chain Necklace. Shipped with USPS First Class Package. Ending Thursday at 9:35PM PDT3d 8hMetal: Sterling SilverStyle: ClusterLength: Over 35"
It is in excellent condition and extra long, perfect for wrapping and layered looks. GORGEOUS Elongated Box Chain Link Extra Long Opera Length Sterling Silver Necklace, made in Italy by Milor, sold on QVC! New in and unworn. Measures 50" in length, end to end and weighs 36 grams. Lobster clasp mechanism functions properly. Stamped 925, Italy, Milor. Excellent Condition, that is Unworn, bright and shiny! Give as gift or immediately wear upon delivery! Shipped with USPS First Class Mail Package Box. Sterling Silver Box Chain 36" long and 2.0 mm. Genuine Sterling Silver. 8 Sterling Silver Beads 9.5 mm. NO RESERVE. WE ASK THAT YOU DO THIS TO PREVENT ANY MISUNDERSTANDING, CONFUSION, AND INCONVENIENCE. Ending Today at 6:22PM PDT4h 48mMetal: Sterling SilverStyle: ChainLength: Over 35"
Charm Thomas Sabo Sterling Silver Belcher/Rolo Chain 35.5” (90 cm). Marked with Thomas Sabo signature and 925. Lobster clasp marked 925. Beautiful, like new condition. Photos are enlarged and of the actual item you will receive. Authentic Pandora Sterling Silver Necklace Chain - Adjustable Hasta 70. Shipped with USPS First Class Package. 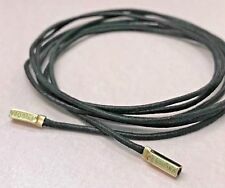 This unusually long 14k solid gold rope chain is60” and 3mm wide. As you can see from the images, you can double or even triple it around your neck to great effect. It is in in perfect condition and will be sadly missed. Hallmark: Au750. Length: 40 cm=15.7"L. All are qualified. It's really rare in China that people could do it perfectly well at minimum price. Craft: Classic design, and good craft. We believe everything can be solved by open communication. Affinity sterling silver diamond shape station necklace in excellent condition. It is hallmarked 925 and signed with Affinity logo. This necklace is 36" long and weighs 15 grams. Made in Italy by Milor, a prominent jewelry manufacturer headquartered in Milan, Italy. It is stamped "MILOR MADE IN ITALY 925.". The necklace weighs about 15 grams. This is a well made, high-quality necklace. Bezel for 1 oz. Silver Krugerrand 2017-2019. This is a Sterling Silver Reeded Edge Bezel to fit a 2017-2019 1 oz. Silver Krugerrand. There is a screw across the top that securely holds the coin the bezel. Here is a a lovely sterling silver 36" textured oval link necklace with lobster claw clasp. The approximate gram weight is 22 grams. My photo's are of the actual item. Local Pick up is available. Ending Saturday at 2:30PM PDT5dMetal: Sterling SilverFeatures: Lobster ClaspLength: Over 35"
From Caviar bracelets to new collections, LAGOS conveys a vision of bold femininity and ignites the desire to own classic, iconic jewelry. 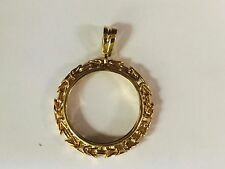 Authentic LAGOS Sterling Silver Rare Wonders Caviar Celestial Sun Pendant Necklace. This necklace is made of solid rhodium plated sterling silver and is stamped "925.". Solid rhodium plated sterling silver. Most of our jewelry is plated with rhodium to prevent tarnishing and give silver a more expensive, "white gold" look. SENSATIONAL ESTATE RARE .999 STERLING SILVER USA SNAKE CHAIN LADIES NECKLACE 48"
It has a Lobster clasp for it's closure and has a nice solid feel to it. It's a RARE FIND as it's. 999 SOLID STERLING SILVER and, made in the USA! The photos don't do it justice. They will have light to normal wear and tear. Metal: Sterling SilverStyle: ChainLength: Over 35"
Fantastic John Hardy station wheat necklace made of 925 sterling silver with 10mm ball stations about every 2-1/4". The weight is 71 grams. It is in excellent pre-owned condition. Every girl needs one of these in her jewelry collection. Solid. 925 Sterling Silver Beveled Herringbone Extra Long 36" Length Necklace. Hallmarked BIB ITALY 925 on end tabs and 925 on clasp. Weighs 12.5 grams. Beautiful LAGOS Beloved Locket Pendant Necklace 36" Ball Chain Sterling Silver & 18KTpendant necklace. Sterling silver and 18K gold locket with fluting and Caviar beading. I had HOPE engraved on back. Heavy Modern Square Cushion Link Necklace in 925 Sterling Silver. - WEIGHT: 78.2 Grams. - CONDITION: Good pre-owned condition. The charms are 4 styles, pointy and round clover's, and their silhouettes. A long and finely made necklace featuring 8 solid 14K white gold charms separated by a supple 14K yellow gold rolo/cable chain. INVENTORY#: FMD179. UNIQUE LONG CURB CHAIN WITH BEADED DESIGNS NECKLACE. Estate Sterling Silver. Made of Solid Sterling Silver. THERE IS NO PROBLEM THAT WE CANNOT FIX. NOTE: IF THIS ITEM CONTAINS A GEMSTONE: WE ARE NOT AN EXPERT ON GEMSTONES, THE LABELING OF THESE GEMSTONES IS OUR BEST GUESS AND MAY NOT BE CORRECT. Silpada 'Ravenna' Elongated Rope Necklace. Shipped with USPS First Class Package. Brand new, never worn. Paid originally $199. Solid 14 K Yellow Gold Double Link Necklace 40" Long Lobster Clasp 10.6 g MINT!! Lobster claw clasp. 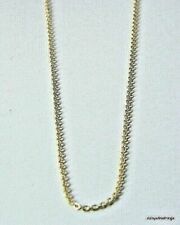 Solid 14 K Yellow Gold Double Link Necklace 40" Long. MINT condition. Like a new necklace. 40" length is not seen very often. Owned and well cared for by one person. Super comfortable. *Welcome To My Auction* *********** *From QVC's Web Site* Shine like a superstar. Polished to perfection, this super cube box chain necklace sparkles in sterling silver. Polished endcaps finish the look with a fabulous flair. From Silver Style(R). Sterling silver Super cube box chain; endcaps; polished Lobster claw clasp Measures approximately 54" L x 1/16"W Imported *********************** Make sure to take a look at my other vintage and estate items up for auction. I am happy to combine shipping and handling for multiple purchases. Thank you for your interest in my auction. Happy bidding. Hallmarks: 950, Italy, Milor. • Type: Necklace. Photos are taken with as much detail as possible. IF OUR ITEM CONTAINS A COLORED GEMSTONE, WE UTILIZE PRESIDIUM GEMSTONE TESTERS. For sale is a solid 22k Indian gold choker pendant style necklace. Purity: 22k - 9160/1000. I have had it tested and there is a slight abrasion on the back of one of the bell shapes that hang from the necklace - barely noticable and does not spoil the chain - see last picture. Beautiful solid 14k yellow gold Sufism, Dervish, Buddhist Mantra HU charm pendant. Authentic John Hardy sterling silver oval rolo necklace. This could easily be worn on it's own or with a pendant. The chain alternates between 1 larger link and 2 smaller links. The clasp fits through the larger links so it could be worn a virtually any length. Reverse 1917 S Silver Walking Liberty Coin on 36" Italy. 925 Silver Round Chain. This coin has solid fine details. Feel free to check out ourother jewelry and coins. and add us to yourfavorites list ! • Link Type: Franco. Take the sterling silver spiral necklace, for example. When you see it, you’ll think of a snake until you wrap its smoothness around you neck. No matter who is receiving the chain you’re buying be sure that you choose the best pieces you can afford. Handmade 29.11grms Sterling Silver Cable Link Chain Necklace Valentine Gift ! !